Many areas of Sierra Leone are dry for three quarters of the year. Water can be scarce at times. Sun is a year round resource and can be harvested cheaply and easily. Lorentz, a German company, is offering a solar water pumping system that is efficient, effective and applicable to the Salone environment. Lorentz has been in Sierra Leone for three years and is now working with Brunnenbau Conrad (bbc) Sierra Leone Ltd. Lorentz operates in 143 countries and sells products in over 100 countries. 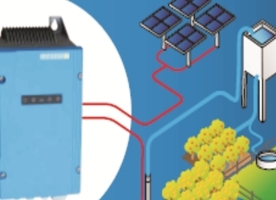 The solar water pumping system is designed as an off-the-grid solar pumping system with all the input and outputs needed in an integrated self -managing system. Head of Marketing of Lorentz Solar Water Pumping Company, Andrian Honey, said, “We are in the country to share our global experience of how solar water pumping can help developing countries. It can help by making water widely available for people to drink; for irrigation; it can help in energy usage in the country”. Honey said energy that cannot be used on pumping water maybe can be diverted to other functions like light and power. The Lorentz PS2 is an integrated solar water pumping system for small and medium sized applications. Using solar power means that one can install a pumping system anywhere, irrespective of power infrastructure and the associated cost and operational cost savings are achieved as the system requires no fossil fuels and it can be fully remotely managed. The solar water pumping system is fed from a series of solar panels that channel power into a controller that can analyse inputs and optimize the water outputs. From the controller, the power runs into a submersible pump located in a bore hole. The pump is controlled by software that an operator can run via software apps on a smart phone. Because the system is solar powered, the entire system can be installed in remote areas, many kilometres from any power grid, and can function for a family or for small communities. Dear JAMIL, What is “Lorentz Solar Water Pumps”? I do not understand that what is this, What the cost of Installation of “Lorentz Solar Water Pumps” in Karachi Pakistan, Can you brief me?